How do you keep track of the various projects or to-do lists in your genealogy? Do you fill sticky notes with ideas about what to do next or get overwhelmed with all of the thoughts running through your head? Google Keep is my new favorite productivity tool and it might be just what you need to organize your genealogy life. Think of it as a place to keep all of your sticky notes – electronically. You can access Keep on the web at keep.google.com, install and use the Keep Chrome browser extension, and/or download the Keep mobile app on your phone. Your notes can contain text and lists, images, web content and even audio recordings. With Google Keep’s sharing ability you can collaborate with others on notes and lists. 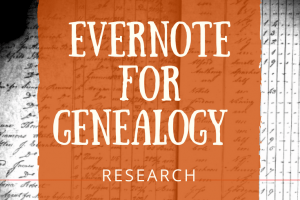 I previously wrote about Evernote and how I use it for Genealogy Research and Creating a Genealogy Reference Center. For me, Evernote is a workhorse where I store vast amounts of information for my use in researching my family history. Google Keep helps me keep track of everything I need to do in my genealogy life. I have several different areas that I need to keep on top of: client projects, genealogy conference presentations, blog posts, study group assignments, organization projects, photo projects, and more. Before I started using Keep I tried written to-do lists on paper, in electronic documents, and in Evernote. Those options were okay, but I like the visual sticky note format of Keep. I check it every morning to see what I need to focus on for the day. The screenshot below gives you an idea of how I use Keep to keep track of my various to-do items. To get started, visit Keep on the G Suite Learning Center for tutorials or simply type keep.google.com into your internet browser. If you are signed in to your Google account on Google Chrome, you’ll automatically be taken to Google Keep and will be able to start creating notes. If you haven’t created a Google account, you’ll need to do this. It’s easy and free. You’ll then be able to access Google Calendar, Keep, Docs, Sheets, Gmail, and other helpful apps. 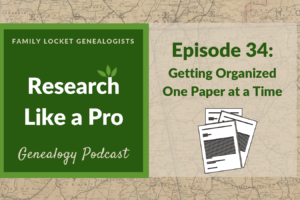 How can Google Keep help you be more productive and organized in your genealogy research? As well as making lists of to-do items Keep can help you stay focused when working on a research project. One of the biggest challenges we face as genealogists is the huge amount of information available online. Staying on task can be difficult when searching a new record collection. We may want to enter every surname we research into the search box. 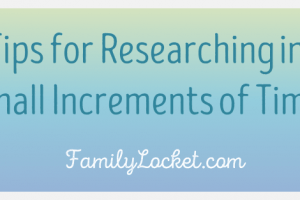 Before we know it, we’ve completely digressed from our research plan. With Google Keep, we can make ourselves a note to return to that collection in the future. Let’s take a look at each type of note we can create and an application for genealogy research. Create a note in Google Keep by typing in the white box that appears at the top of the screen titled “take a note.” That will create a text note. You also have the option to start a new list, a new note with an image, or a new note with a drawing by clicking on one of the icons on the right. You might be listening to a presentation on Google Earth at a genealogy conference and you think of a great application to your research. On your phone or your laptop, you could quickly type a note to yourself: Check Google Earth for the Royston family in Chambers County, Alabama. Now, you don’t have to try to remember that idea, it’s saved in Google Keep for you to view at anytime. In the example, I gave my note the title of Royston Research and colored it green. I can change the color of my notes anytime by clicking the palette icon. Clicking the finger icon let me set a reminder for this note. I set “today, 8:13 am” as a test. Because I have the Keep app on my phone, I was reminded at precisely 8:13 am. You can select any time and date for the reminder. If you decide you’d like attach an image to the note, you can click the mountain icon and select an image from your computer. You can also click the arrow icon to archive any note. That will send it to the archive folder. It will be saved, but won’t show up on your screen unless you select the archive folder. My favorite types of notes are lists. I have lists for everything in my genealogy life: conference presentations, client projects, organizing projects, books to read, and more. To create a note with a list, click the icon highlighted below. Once you start typing in the box, you can quickly enter the items in your list and add a title. In this example, I’ve titled the note “Dillard Muscogee County Research.” As I was creating a locality guide for Muscogee County, Georgia, I came across a source that I wanted to check for the Dillard family. Because I was following my research plan for a different project, I didn’t want to chase after this bright, shiny object. Instead I created a sticky note for the Dillard research so I wouldn’t forget my ideas. I can add as many items to the note as I’d like then check them off when completed or delete them. Notice the label genealogy at the bottom of the note. You can add as many labels as you’d like to a note but it’s not necessary to label a note extensively because entering any word in the search box at the top of the page will quickly find all notes with that word. I don’t need to label the note Dillard or Muscogee County because searching for those words immediately brings up this note. You can add an image to any note after it’s created or you can start with an image and then add text. In this example, I created an image note by uploading a marriage record image that I had discovered on FamilySearch. I wanted to investigate it in the future and didn’t want to lose it. I could also have just made a text note or put the link. If you’re a visual person, you might like adding images to your notes. The source citation and link to the actual image are also attached so I can revisit the record on the digitized microfilm. I attached the general label of “Genealogy” and “To Do” to my note. Again a search for any of the words such as probate, Alabama, or Royster will quickly locate this note so I don’t need to label extensively. Google Keep comes with several stock labels, but you can create any labels that you’d like. Clicking on a label shows only the notes with that label. I can see at a glance all of my genealogy notes and decide what I want to work on for the day. If I only have an hour for personal research, I can choose a few tasks, then cross them off my virtual sticky note. Google Keep will allow you to create a note with a drawing and has several tools to use. I haven’t found a good use for the drawing tool with my genealogy and family history work, but if you do, leave me a comment. I’d love to know a helpful application! Experiment with Google Keep and see how it can work for you. It may be just the thing to keep you organized and on top of your various projects. I use Google Keep and really enjoy using. It is easy to use, works with all the other Google features I use. I see we both have the APG Conference on our Google Keep, see you there! How great that you’ll be at the APG Conference!I’m looking forward to it. See you soon. That’s too bad. Maybe someday Opera will have something similar! This is really great. I hadn’t heard of Google Keep before, so I’m excited to try it out. I’m always looking for better ways to get organized. Thanks for the tip! You’re welcome! After I discover a new productivity tool, I always wonder how I did without it. Google Keep is definitely one of those. Have fun getting more organized.